At the time of its release, Jonathan Demme's Philadelphia was the first big-budget Hollywood film to tackle the medical, political, and social issues of AIDS. 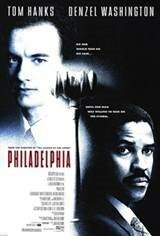 Tom Hanks, in his first Academy Award-winning performance, plays Andrew Beckett, a talented lawyer at a stodgy Philadelphia law firm. The homosexual Andrew has contracted AIDS but fears informing his firm about the disease. The firm's senior partner, Charles Wheeler (Jason Robards), assigns Andrew a case involving their most important client. Andrew begins diligently working on the case, but soon the lesions associated with AIDS are visible on his face. Wheeler abruptly removes Andrew from the case and fires him from the firm. Andrew believes he has been fired because of his illness and plans to fight the firm in court. But because of the firm's reputation, no lawyer in Philadelphia will risk handling his case. In desperation, Andrew hires Joe Miller (Denzel Washington), a black lawyer who advertises on television, mainly handling personal injury cases. Miller dislikes homosexuals but agrees to take the case for the money and exposure. As Miller prepares for the courtroom battle against one of the law firm's key litigators, Belinda Conine (Mary Steenburgen), Miller begins to realize the discrimination practiced against Andrew is no different from the discrimination Miller himself has to battle against. The cast also includes Antonio Banderas as Andrew's partner, Joanne Woodward as Andrew's mother, and Stephanie Roth as Joe's wife.